This August, 1976 brochure of 15 pages (back cover basically blank) is black and white with a blue spot color added for titles, etc. It provides a good deal more text explanation of the system and its components than does the color MITS Altair brochure, while its photos are smaller and black and white. 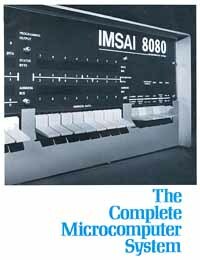 I bought an IMSAI 8080 as my second microcomputer when I decided to get into board design and testing.